The Biopunch® is a coring tool designed to core, punch and retrieve samples from thin or soft substrate source materials such as tissue, gels, paper, cloth, leaves, paint chips and films. The Biopunch® consists of a sure grip hollow plastic embossed handle with a razor sharp seamless stainless steel cutting tip protected by a clear removable cap. Each Biopunch® is individually packaged sterile with lot number and expiration date clearly imprinted on the package. Available in 9 core size diameters: 1.5 to 8.0 mm or a Mix Pack of 5: 2.0 to 6.0mm, all punches are color coded by size. This is a disposable sampling tool, ideal for tissue processing or forensic applications. For some applications where contamination is not an issue, the Biopunch® is reusable after cleaning. Cleaning Tip: Clean cutting tip between each sample extraction by coring blank filter paper; rinse with ethanol or spray with compressed air to remove dried artifacts. Self Healing Cutting Mat, Blue, 3.5" x 5.5"
The EMP 5160 is a productivity tool for the Electron Microscopy Laboratory. If you are embedding three or more times per week you cannot afford to process by hand. The EMP 5160 uses a proven robotics system to move baskets of tissue from one vial to another and agitates at the time and force you program, at the temperature you desire. Microprocessor based with room for 50 protocols built into the instrument. These can be preprogrammed for you, sent to you on preprogrammed keys later or put into the unit or keys by the operator with the handheld programming unit. Sealed vials for operator safety, the vials can all be loaded in a hood and the EMP5160 operated in an open room. Transfer of the vials does not expose the operator to fumes as other units do. Programming is done via detachable hand held keypad. When you have finished programming the programming unit is locked away to prevent tampering or accidental changing of a protocol. Frugal! Can use just a couple of milliliters of fluid for one sample up to 18ml for a full load (up to 48 sample compartments). Two proven sample handling systems, either the traditional snap rings with removable screens or the multi-compartment baskets. Either type have all tools included. Your laboratory can keep the same quality as manual processing but gain the time for other tasks and the convenience of doing things on a more predictable schedule. All tissues can be loaded and the timing set so that the tissue finishes at the time you desire. Each morning or afternoon the tissue is ready for you when you want it. The processor can come to you with your protocol loaded in internal memory. Your programs can be on external “data keys” that look like a large plastic key but have a memory chip inside, these can be programmed by you or RMC. This is great for backup purposes, it is also a big relief if the primary operator is out and no-one is sure which protocol is loaded to run. By just putting the key into the unit and turning it the program is loaded, now just press Start. You can call this in from anywhere with confidence. This is the only system that uses sealed vials for all reagents. With any other carousel system, the operator is potentially exposed to multiple hazardous vapors upon trying to inspect the process, change vials, retrieve the stack, etc. This can unnecessarily expose the operator and institution to risks. 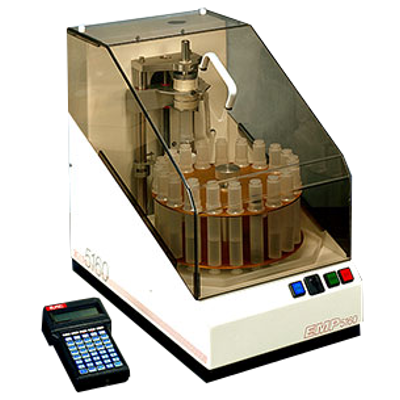 The EMP 5160 vials can be loaded in a hood, the instrument can be operated outside the hood and allows complete inspection of the system while operating, exchanging of vials, pulling the stack for adding samples, etc. without exposure to all reagents in the system. The EMP 5160 uses traditional stack rings with stainless steel screen bottoms or the molded, one piece design with a center post. Both come with all the loading tools* necessary for easy and safe loading. These two sample basket systems allow processing of up to 48 samples per run, running a few large samples up to 5mm x 5mm or extremely fine samples depending on your needs. Specimen holders A) Molded plastic with three or four specimen compartments per basket. C) Single compartment specimen stack rings for larger samples. B) Rechargeable battery providing up to 30 minutes of full operation in the event of power failure. No temperature regulation during back-up by battery. Specimen Drip Between reagent vials, specimens are parked in the processing chamber & lightly agitated to remove excess liquid. This is a short term process in a saturated atmosphere alleviating any possibility of air drying.